We took the birding class out to Starrigavan for today’s walk. The weather was quite pleasant for a February day. Weather: Partly cloudy skies with pretty calm winds and temperatures in the upper 30s or so. Without any breeze, the sun felt quite warm. Birds: Driving by Swan Lake, I noticed several Ring-necked Ducks and at least one American Wigeon. On the way back, I think I saw a Hooded Merganser. Although Marge Ward had told me there was a large group of Marbled Murrelets off Halibut Point Road on Thursday, we did not see any such gathering today. At Starrigavan there were quite a few gulls on the beach by Old Sitka parking area. Many of them were Herring/Thayer gulls. On the ocean side we saw scaups, goldeneye, Buffleheads, Mallards, a Red-necked Grebe, Surf Scoters, crows, and several Black Oystercatchers. The crows were feeding on the flats by flying up and dropping the creatures on the ground to break the shell. One student was somewhat amused by a wobbly gull trying to balance on a sign. I suggested that it would be like trying to balance on the guard rail, so he tried that and wobbled pretty much like the gull did. On the estuary side, there were two swans, several mallards, a female Northern Pintail, and three female Green-winged Teal. A Great Blue Heron flew out of a tree into the flat near the time we were getting ready to leave. 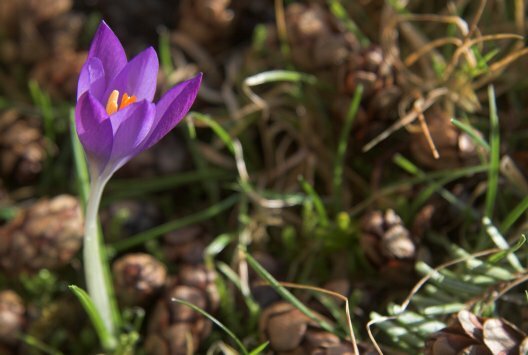 There were too crocus blooming on campus in front of NPH. These are first flowers I have seen this year. I suspect at least one of them had been blooming for a couple of days or so.